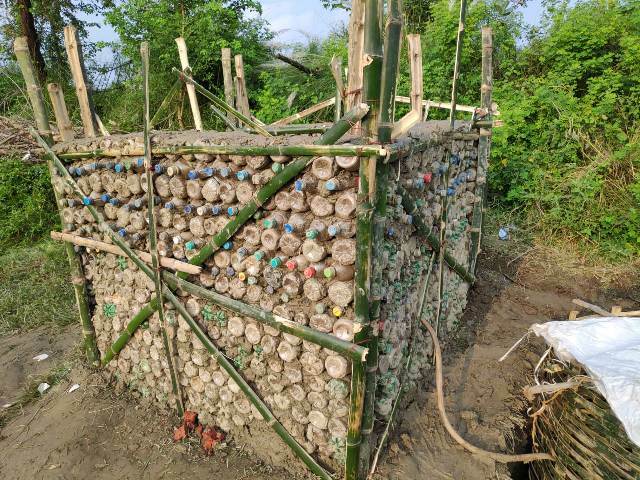 PATNA: Villagers in Bihar are building toilets with used plastic bottles to make better use of waste materials and cut cost. They say the used bottle-made toilets are not only cheaper but also eco-friendly. To begin with, the villagers settled in inaccessible villages in West Champaran district has gone for making toilets through this method. All they require are some bamboo sticks, mud and used bottles to complete the toilet construction which takes barely a day to achieve the task. “We had been facing severe crisis of bricks in the areas. Also, purchasing bricks is very costly for villagers since one piece of brick costs at least Rs eight. So we decided to make use of used plastic bottles abundantly available in the areas to make toilet,” said Ajay Jha who is proud owner of one such toilet. According to reports, the local villagers saw large number of plastic bottles floating in Gandak river which flows by the areas but had not idea about how to use them. Gunj, a non-governmental Organsation (NGO) working among the villagers came to their help and trained the villagers about how to make perfect use of used plastic bottles. “Such toilets are not only cheaper but also eco-friendly. Also it is quake-proof which could prove to be a boon in the whole northern Bihar region which falls in seismic zone,” said Sheoji Chaturvedi, state coordinator for the NGO who is the man behind the idea. According to him, the walls made of plastic bottles are 30 times stronger than brick walls. According to him, thousands of plastic bottles are found floating in the river water every day and they could prove to be a boon for the villagers. Chaturvedi is now appealing the villagers to go for plastic bottles for toilet construction to save environment and cut cost. “We are creating awareness among the villagers about such toilets,” he added. According to an official report, only 33.84 percent families in the state have toilets at home whereas the rest are still compelled to defecate in the open. A report of the Centre for Science and Environment, a New Delhi-based research and advisory body, too presents a horrible picture of Bihar on the sanitation front. According to the study, around 99 per cent of the expenditure of the state has gone towards building of toilets. However, the abysmal quality of the toilets built has meant that their usage has been very low. The CSE’s research findings further state that the target of 100 per cent household toilet coverage in Bihar could happen only by 2033 given the current rate of toilet construction.